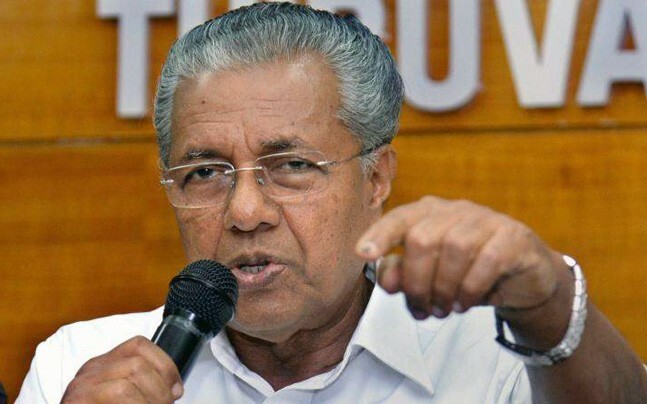 Kerala Chief Minister Pinarayi Vijayan today came down heavily on the Bharatiya Janata Party (BJP) and RSS. Pinarayi today said that the BJP had claimed that Amit Shah would show the party’s strength but the whole yatra turned to wet cracker. “Nobody should think that they can intimidate us. If they think that they can do something here with old RSS faces in the centre and other states, they are wrong,” said Pinarayi. Pinarayi said that the BJP is trying to destroy the secularism with the power of central government. “Kerala has no lessons of peace to learn from you people who consider Nathuram Godse as your god. If you are trying to threaten us, keep in mind that we always dare to take up such challenges,” said the chief minister. The chief minister said that RSS top organisers have clear links to the murders and attacks carried out by their cadres. The yatra is a show of strength by the BJP to protest against the murders and incidents of lynching of BJP and RSS cadres allegedly by the ruling Left cadres in the state. The Jan Raksha Yatra will cover 11 districts and will end on October 17 in Thiruvananthapuram. On reaching Kerala to take part in the march on Wednesday, Adityanath had said that people need to be made aware of the political killings if they are taking place under political patronage. By raising the political killings in Kerala under “political patronage”, the BJP is aiming to achieve the its objectives that highlighted in the run-up to the UP Assembly elections held earlier this year. The BJP, which has just one member in the 140-seat Kerala Assembly, had garnered 15 per cent of the votes polled during the 2016 Assembly elections and 10 per cent in the 2014 Lok Sabha polls. It is seeking to cross the 20 per cent threshold to become a third force in the southern state. Be the first to comment on "Pinarayi Vijayan on BJP Yatra: Kerala has no lesson to learn from followers of Nathuram Godse"